Leggings are skin-tight fashion pants that fully or partly cover the legs. Leggings can be used fully exposed, or partially covered. How to Measure Leggings Size? Like for other kinds of pants, you can determine leggings size from waist and hips measurements (+ inseam measurement for length). But unlike many other pants, leggings are supposed to fit very tight. Because of this, you may also consider taking your weight (and body height) into account when determining leggings size. By doing so, you will increase the chance of finding a perfect fitting pair of leggings. You can use both size charts (Leggings Size by Body Measurements or Leggings Size by Weight & Height) separately, but we recommend using both of them. That way it is more likely you will get a impression of which size that is you perfect leggings size. Waist: Measure your body around your natural waistline. Your waistline is usually situated just above your belly button (narrowest part of torso). Not sure where you waistline is? Stand in front of a mirror, and bend to one side. Your waistline is simply where you can see a natural indentation in torso on this side. 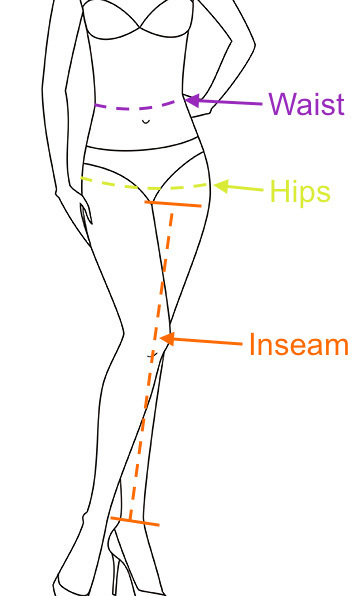 Leg Length (Inseam): Measure from your crotch to your ankle (where you want your jeans leg to end). Ask a friend for help measuring! If you already own a pair of perfect fitting leggings, simply do your measurement on those jeans. Start at the crotch seam and measure to the bottom of the pant leg. Leggings size chart based on waist and hips measurement. For leggings length, see bottom of page. See also Leggings Size Chart based on height and weight below. Leggings size chart based on body weight and height. For leggings size chart based on waist and hips measurements, see above. See also Leggings length chart below. Some leggings brands/models offer different leg length. Inseam measured in inches (see illustration on top of page on how to measure). If length not is given, it is most often 'Regular'. Tips, Tricks or Questions about Leggings? Tips, tricks or questions about US leggings sizing? Please post below. Thanks!